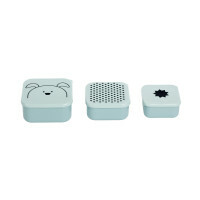 The snack boxes in light blue are available in a handy set of three, made of high-grade plastic, dishwasher-proof and can be stacked into one another. 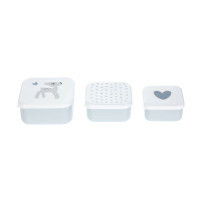 Product information "Snackbox, Lela Light Blue"
description & equipment Snack Boxes, perfect for on-the-go are decorated in beautiful pastel colors with the sweet deer Lela, colorful dots and a small heart. LÄSSIG’s square Snack Boxes in minimalist design, from the Lela Baby Collection are made of high quality plastic and are dishwasher safe. The containers are available in a practical set of 3. When not in use they are stackable in a space-saving way due to their three different sizes. The next snack is guaranteed to put the little one in a good mood.